One of Robert Kennedy's least glamorous assignments in the Senate was a seat on the Subcommittee on Migratory Labor. He was appalled to learn of the miserable working conditions endured by farmworkers, at the mercy of big agricultural businesses. But with a lot of issues on his mind — Vietnam, and the new Bedford-Stuyvesant renewal project in his own state — it hardly seemed like one he could take on. So when labor activists and some of his aides prevailed upon Kennedy to show support for striking farmworkers in March of 1966, he resisted. "Why am I dragging myself all the way out to California?" he complained on the plane to Peter Edelman, his point man on the issue. Then he spent a day with Cesar Chavez. "By the end of the day, Kennedy had embraced Chavez and La Causa," writes biographer Arthur Schlesinger. RFK was so angered by what he saw, and so impressed with Chavez, that all doubts about getting involved with the farmworkers were erased. Cesar Estrada Chavez was born in Yuma, Arizona, in 1927, to a farm-labor family of Mexican descent. When his successful father suffered a financial reversal in 1937, the family was forced to join the roughly 300,000 migrant workers who followed the crops to California every year. Growing up in a succession of overcrowded migrant camps, Cesar managed an eighth-grade education. He served for two years in the U.S. Navy during World War II, then returned to migrant work in the Southwest and California. Chavez and his new wife, Helen, began teaching their fellow farm workers how to read and write in the hope that they might lobby for better working conditions and fairer wages. After being recruited by the Community Services Organization (C.S.O. ), Cesar started part-time work as a labor organizer, overcoming his own shyness in the process. Chavez rose to general director of the C.S.O. 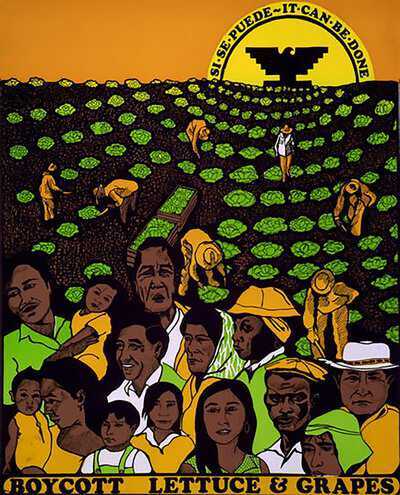 in 1958, but resigned after four years to found a new organization, the National Farm Workers Association (N.F.W.A.). 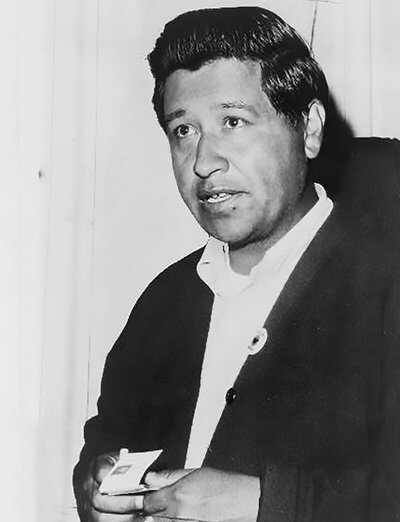 In 1965 Chavez and the N.F.W.A. initiated a California grape workers' strike backed by a national consumer boycott of California grapes. The grape strike became a cause celebre among liberals, gaining national support for the farmworkers and their cause. Like subsequent battles with lettuce growers and other agribusiness interests, the campaign ended with a bargaining agreement between the owners and workers. In 1966, the N.F.W.A. merged with the AFL-CIO to form a new union that since 1971 has been known as the United Farm Workers of America (U.F.W.). 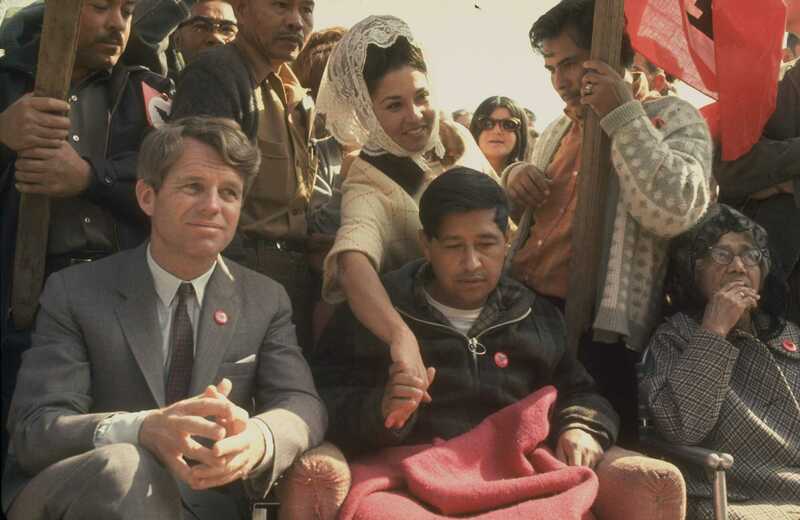 Robert Kennedy's first trip to see Chavez in Delano, California, began with a public hearing on the standoff between striking grape pickers and law enforcement, and it got his blood up. During the questioning of a sheriff who admitted to arresting strikers who looked "ready to violate the law," Kennedy shot back, "May I suggest that during the luncheon period of time that the sheriff and the district attorney read the Constitution of the United States?" Journalist Jack Newfield, who repeatedly saw Kennedy affected by face-to-face encounters with injustice, puts it well: "It took the experience of the hearings to let his head catch up with his heart." Getting to know Chavez and learning about his commitment to nonviolent protest strengthened Kennedy's resolve to fight for the farmworkers. "He said that we had the right to form a union and that he... not only endorsed us but joined us," remembers Chavez's chief lieutenant, Dolores Huerta. "I was amazed at how quickly he grasped the whole picture." 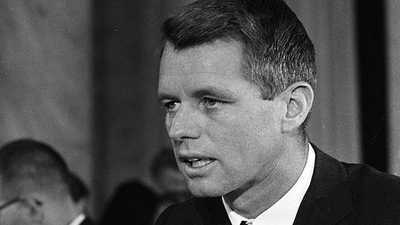 Though his time would be limited, Kennedy's high public profile helped shine a spotlight on the farmworkers' cause, and his attitude boosted the morale of strikers. "Robert didn't come to us and tell us what was good for us," Huerta said later. "He came to us and asked us two questions: 'What do you want? And how can I help?' That's why we loved him." Chavez and Kennedy seemed to form a natural bond. "For all their differences in background," writes Schlesinger, "the two men were rather alike: both short, shy, familial, devout, opponents of violence, with strong veins of melancholy and fatalism." Kennedy, who admired courage above all other qualitites, found plenty of it in Chavez. 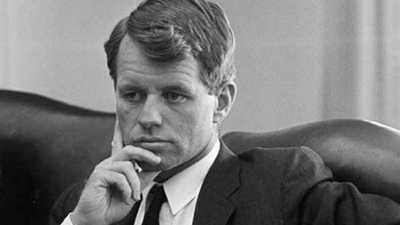 Two years after RFK and Chavez met, Kennedy was in the midst of an agonizing decision over whether to challenge President Lyndon Johnson and anti-war candidate Eugene McCarthy for the Democratic presidential nomination. Nevertheless, on March 10 he flew to California to help Chavez end a 25-day fast, offered as public penance for the violence that had resulted from his union's strike tactics. Chavez, who had lost 35 pounds in 25 days, was too weak to speak at the Mass of Thanksgiving in his honor. But someone read his speech, which included the following words: "It is how we use our lives that determines what kind of men we are... I am convinced that the truest act of courage, the strongest act of manliness, is to sacrifice ourselves for others in a totally nonviolent struggle for justice. To be a man is to suffer for others. God help us be men." The grape boycott's success attracted the attention of the Teamsters Union, which entered the fields as a rival organizer. Appealing to the AFL-CIO, Chavez and the U.F.W. fought the Teamsters in the fields as well as in the courts. The two unions resolved the issue with an agreement in 1977, which gave the U.F.W. the sole right to organize farmworkers. Chavez died in 1993. The following year his wife, Helen, accepted a posthumous Presidential Medal of Freedom for her husband's years of nonviolent activism on behalf of workers' rights. In 1957, the Rackets Committee was born. 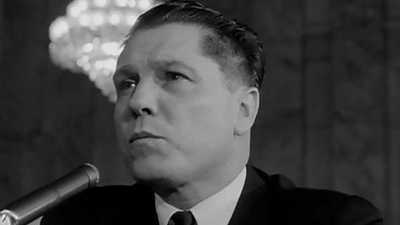 During one hearing, there was an epic clash between RFK and Hoffa.